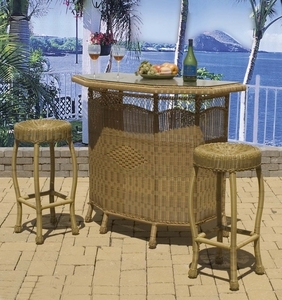 The perfect "All Weather" bar for outdoor entertaining on your deck or pool. Made of hand-woven vinyl/resin fibers over powder coated steel frames, which provides strength and durability. One glass shelf and one hand woven shelf provide space for bottles, glasses, plates and utensils. Tempered glass top included. Two-Toned Natural finish.